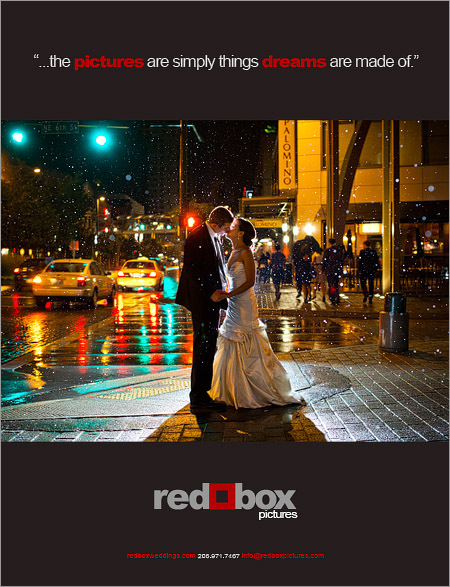 The one and only 2012 Seattle Wedding Show is just around the corner, and once again, Red Box Pictures will be there in full force. Whether you’re a current client or future one, we hope you’ll visit the show and stop by our booth (#1328). We’ll have some special deals for those who book us at the show, and some awesome new sample wedding albums to show off. If you have experienced or heard about long lines to get into the show in past years, worry not! You are now be able to purchase tickets online prior to arriving at the Convention Center, so all you’ll have to do is pick up your copy of the new magazine before heading straight for our booth. Speaking of the show magazine, keep an eye out for our full-page at near the front. It features Dan’s awesome photo of a couple in the rain and a touching quote from the mother of one of our very cool grooms. Head on over to the Seattle Wedding Show web site to purchase your tickets now…we look forward to seeing you there! This entry was posted on Thursday, December 8th, 2011 at 2:03 am. It is filed under NEWS + BUSINESS and tagged with seattle wedding show. You can follow any responses to this entry through the RSS 2.0 feed.